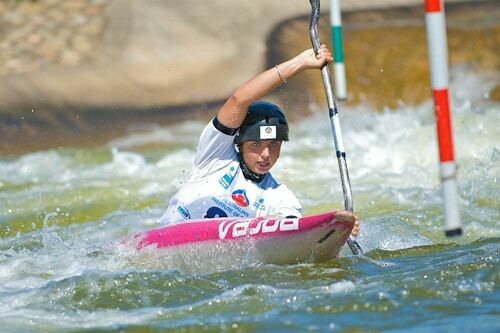 18-year-old Jess Fox has won silver in the kayak slalom. Two University of Sydney Olympians added to Australia's medal tally at the 2012 Olympics on the sixth day of competition with our youngest Olympian, first-year student Jess Fox, taking silver in the kayak slalom. On the opening day of track cycling in the Olympic velodrome University of Sydney alumna and former Elite Athlete Program (EAP) scholarship holder Kaarle McCulloch won bronze in the women's team sprint with partner, Australian sprint champion Anna Meares. Jess was the third of 10 competitors to tackle the demanding course, which has enough water flowing into it to fill a 50 metre swimming pool every minute. Her score of 106.51 was enough to place her in gold medal position before she eventually lost by just 0.61 to the eighth competitor to race, France's Emilie Fer. "You always dream of a medal, you always dream you can get up there on the dais," the first-year media and communications student told the Sydney Morning Herald. "I knew if I had a good run, I could be top four or five, my main aim was to make the final. I'm still 18, one of the youngest to race and making the final I was stoked." The Lee Valley White Water Centre in east London has provided thrilling competition during the opening week of the Olympics as competitors battle to descend the 300-metre course as quickly as possible without incurring time penalties by hitting obstacles. Another University of Sydney Olympian, engineering and IT graduate Kynan Maley, took sixth position in the men's singles event earlier in the week. Jess is also supported by the Sydney Uni Sport & Fitness EAP scheme. Her success outstrips the bronze medal won for France by her mother, Myriam Fox-Jerusalmi, in the same event at the 1996 Atlanta Olympic Games. Her father, Richard Fox is a multiple world champion for Britain. The couple now both have a role in coaching Jess. "Someone said to my father the other day that at this rate he might be the only person in the family with no Olympic medal," Jess told The Australian. "My sister (15-year-old Noemi) is still to come, so we'll have to see."